Killer Innovations :: Chassis Systems :: Tactical Works, Inc.
Mega Arms and Killer Innovations have teamed up to manufacture the most technologically advanced chassis system available on the market today. The Orias Chassis. This Orias Chassis has the removable rear Type T1 Trunnion to accept buttstocks that have the lower 1/2" diameter locating pin for AR-15 style buttstocks that use a rear sling/indexing end plate or have an integral locating pin (like the Magpul PRS stock). The type T1 Trunnion will only accept flat top grips without the beavertail. 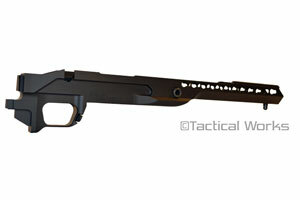 This Orias Chassis has the removable rear Type T2 Trunnion to accept buttstocks that do not have the lower 1/2" diameter locating pin. This trunnion is designed for buffer tube style buttstocks that use a locking nut. The trunnion has a small set screw that locks and indexes the buffer tube into position. The type T2 Trunnion accepts grips with a beavertail. Orias Chassis Rear Trunnion Type "T1"
The removable rear Trunnion Type "T1" for the Orias Chassis by Mega Arms and Killer Innovations. The Type T1 Trunnion was designed to adapt the chassis to accept buttstocks that have the lower 1/2" diameter locating pin for AR-15 style buttstocks that use a rear sling/indexing end plate or have an integral locating pin (like the Magpul PRS buttstock). The Type T1 trunnion will only accept flat top grips without the beavertail. Orias Chassis Rear Trunnion Type "T2"
The removable rear Trunnion Type "T2" for the Orias Chassis by Mega Arms and Killer Innovations. The Type T2 Trunnion was designed to adapt the chassis to accept buttstocks that do not have the lower 1/2" diameter locating pin. This trunnion is designed for buffer tube style buttstocks that use a locking nut. The trunnion has a small set screw that locks and indexes the buffer tube into position. The Type T2 trunnion accepts grips with a beavertail. Great product, I have several. I use velcro instead of their rubber. but a must have item on a stock with non-adjustable cheek or one that does not fit you well.